Andrew as you have never seen him before! The photos are being emailed to me thick and fast! I didn't realise that my scouting colleagues were in to the performing arts in such a large way. It would almost seem Harewood and Bishopdale scout leaders like nothing better than slapping on a pair of tights and a tutu! Should they form a dance troop and perform at Staveley? Please let me know what you think? This photo was sent to me on the strict understanding that the person who came by it remains totally anonymous! I am only too happy to oblige! Now we all know what Papabear looks like in a pair of ballet tights, and it has to be said, a rather snazzy blushing pink tutu! 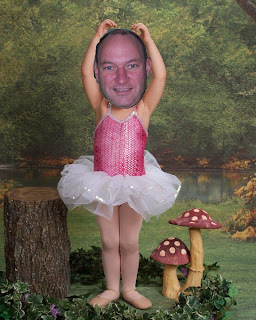 He is pictured here putting in some serious ballet practice in preparation for the Staveley 2009 camp. Get those legs up. One, two, three, one two, three. Shoulders back! Make sure you tell Papabear that 'horse-with-no-name' sent you. 24 hours in and we are still at it! 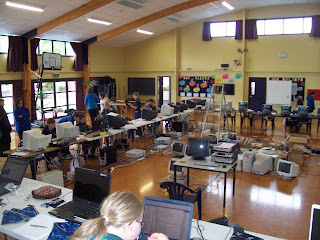 24 hours in to JOTI 2008 and to date we have had 80 keas, cubs, scouts and venturer scouts taking part. We have had 37 campers and 43 day visitors. All lot of fun has been had by all and the whole camp has been one huge success. Mrs Mann .... I tell you! How much evidence do you want? 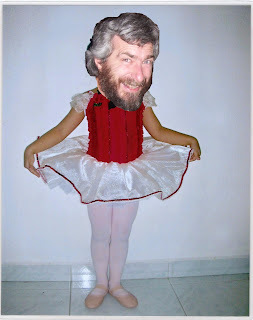 I am beginning to wonder what papabear would look like in a pair of ballet tights! Mr Rikki Tikki Tavi is starting to show his age. This exclusive picture clearly shows he is starting to go a little thin on top. We are all acutely aware that he is getting married soon and we all feel sure his lovely fiancee will not want to have the wedding photos spoilt by the glare from his bald spot. So we would like to do him a favour by putting out an appeal for a hair piece or wig which will cover his embarrassment. A fitting and formal presentation will be made at the Staveley 2009 camp. All donations via papabear who is also looking! The leaders have been sat on the school hall stage so we can keep an eye on things. From left to right you have papabear, jaymo-black, archer62, horse-with-no-name, he-whose-name shall-not-be-mentioned, fixer and jon-e. I will stay up ......... zzz ZZZ! Blare & Matthew didn't quite make it through the night. They literally crashed out in front of their respective computers. 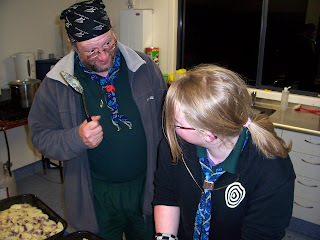 You really got to wonder how much junk was eaten and drunk to get some of the scouts through the night! The resulting wreakage tells its own story! 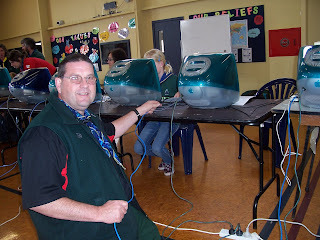 Staying awake all night for JOTI can be difficult. The chairs are not very comfortable but Daniel has found a really comfortable place to sit ....... on top of Shannon! If you think about it it makes perfect sense. She is soft to sit on and she has the added benefit that she gives off her own body heat so she keeps Daniel warm in the process. Maybe Daniel could shift-up a bit so we can all sit on Shannon! A vicious attempt to bearnap one of Papabear's teddy bears was foiled this afternoon. 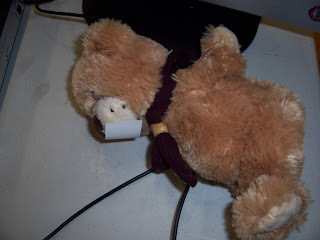 The bear was found by the side of Papabear's computer with her paws tied behind her back and a sticky label placed over her mouth. Papabear was not available for comment as he was cooking dinner but it was thought he would be very pleased by the news. The bear is said to be comfortable. The only thing with an appetite as big as a Scout is a horse (or an elephant!). The Torlesse scouts are only to happy to form an orderly queue when they know there is food in it for them. The scene from the workhouse - the scouts eagerly shovel down the Macaroni Cheese. Ben even asked for some more! 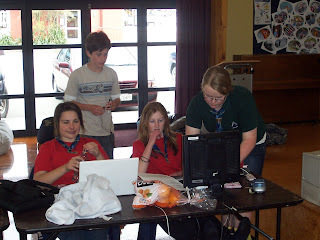 The scouts have been working the world with their JOTI contacts. 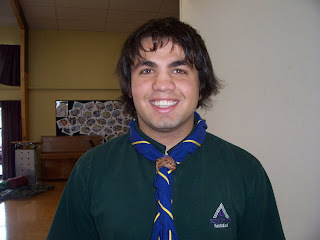 One scout has obviously found his hair has been getting in the way! In my day you just used to get a hair cut! Rikki Tikki Tavi recently won the 'Mr Harewood & Bishopdale' competition. With his fine looks and shiney white teeth you have to wonder how many Guides and Rangers have his photo on their bedroom walls! For someone who claims to 'know nothing about computers' Roger seems to be very adapt at fixing the network cabling issues that we have experienced this morning. Roger has been involved in scouting for many years. Some people even claim he was a scout leader before he was born! 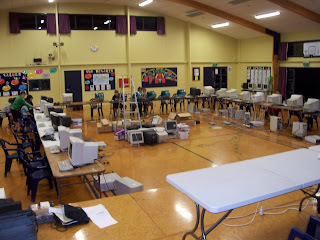 JOTI 2008 is officially about to start. 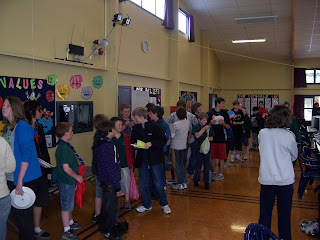 We have had cubs and keas queueing up at the door to get in and start chatting with fellow cubs and keas from around the world. We have 40 connections and we have already exceeded them! 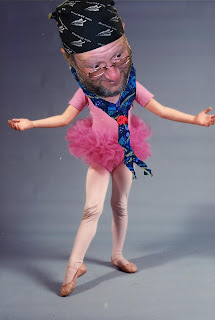 Papabear trys to keep his interest in ballet quiet for totally understandable reasons. However, sometimes he just can't help himself from pirouetting! 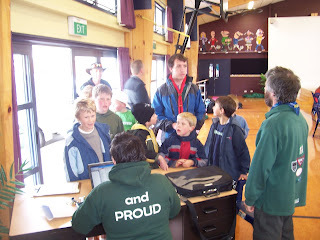 Scouting is no longer a place were 'boys go to have fun'. 'Jaymo Black' (her nickname) seen of the right of the photo is operating some of the JOTI channels and can be seen helping a couple of the venture scouts. Why not try to find Jaymo? She will be lurking in some of the English channels. Say 'Hi' to her and say the 'horse-with-no-name' sent you! Clinton has just become a scout leader - he used to lead a cub pack until his son moved up to scouts. 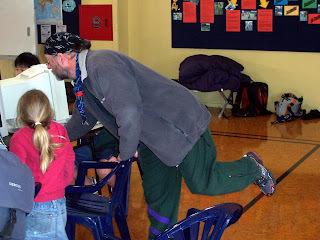 He hasn't done a JOTI before so he is on a steep learning curve. You can see how hard he is concentrating! 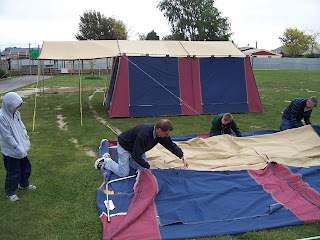 The equipment is all cabled up, the scouts are here, the tents are up so it it time to start JOTI 2008. 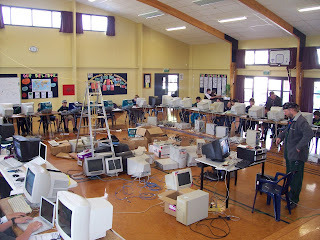 Given New Zealand's location, we are the first to go online. The rest of the worldwide scouting community will join us in the next few hours. 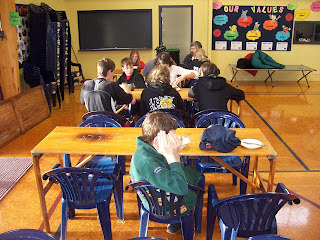 The school has some great facilities which the scouts are starting to enjoy. 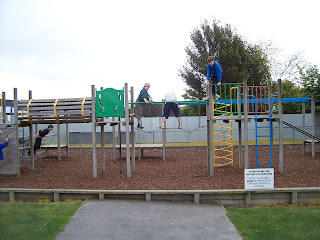 Jake, Ben, Tom and Dion can be seen ape-ing around the climbing frame. Due to the numbers of scouts expected, they are going to be sleeping in tents that are currently being pitched on the school field. However, I would be very surprised if they get much use because most of the scouts will be chatting to other scouts over the internet for most of tonight. Due to the 12 hour time difference between NZ and Europe the small hours are generally the best time to be online. It is Saturday morning at 0800 and time for breakfast. After 6 hours sleep the set-up crew are starting to flag but we are just about to start 24 hours of activity. Daniel looks so tired he is hiding his face from the world! 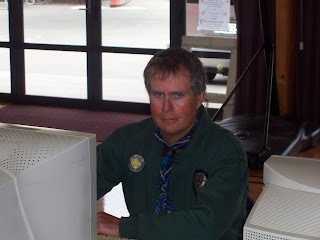 This year the camp has been opened up to the whole Torlesse Zone and we are expecting over 50 scouts, cubs and keas to pass through the doors for JOTI 2008. It should be a great weekend. All the kit has been kindly been donated by a number of businesses and put together over the last couple of years. 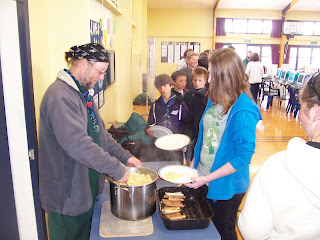 Torlesse Scouts are from Christchurch in New Zealand. The zone includes troops for north Christchurch and south of the Waimakariri River. 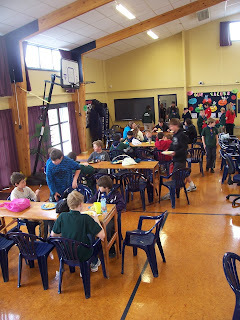 We are running a camp at Cotswold Primary School in Bishopdale, Christchurch.